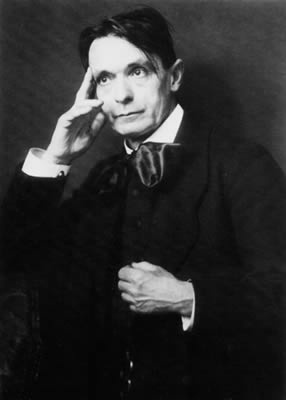 Rudolf Steiner, whose birth anniversary we mark on 25 February, was for many years prior to World War I, a leader of the German branch of the Theosophical Society. One of his best known books is titled Theosophy and the two pillar's of Steiner's approach are in common with other theosophical writers: the law of karma and evolution through the workings of spiritual energy. For Steiner karma and spiritual energy , which he called love, are the basic laws of Nature. For Steiner karma - the fact that every action - and thought is an action - produces an impact and will have consequences. However, without training and close observation one does not see karma working. To see karma in operation requires an insight into the working of subtle energies. He outlines his views in his basic book: Knowledge of Higher Worlds. How is it attained? Steiner believed that he saw subtle energies at work - saw and not just sensed. If one sees subtle energies, then one sees how karma impacts individual lives but also the life of a nation. Steiner stressed that there was a "national soul" and that the action of a country would have long-range consequences such as the First World War which he had experienced. For Steiner, these subtle energies that structured the evolution of humans and nature, he called love. "Love is the creative force in the world". Within the individual, love creates devotion and selfless veneration. "Only that which I love will reveal itself to me, and every revelation must fill me with gratitude, for each one makes me inwardly the richer." This love will gradually widen its love so that it embraces all existence. 2) Agriculture with the ‘biodynamic agriculture’, a forerunner of the growing movement for ecologically-sound agriculture. Steiner was also concerned with social reform but stressed that one needed a positive view of the future and not a criticism of the present. Steiner held that what is needed in times of crisis is not to harbour many thoughts about the surrounding world because such thoughts only strengthen the disorder of the outward world, but one should use meditation — an inner will-permeated work to bring harmony and equilibrium. Nevertheless, Steiner was well conscious of events of the times — the break up of the Austro-Hungarian Empire in which he was born (in what is today Croatia) and the changes in Germany where he had spent most of his working life. Moreover, in 1922, the first Goetheanum, which was built of wood and whose style represented Steiner’s spiritual insights was completely destroyed by fire, probably by Right-wing German thugs. Thus, he turned his attention to proposals for the reconstruction of society, in particular banking as finance and monetary policy was at the heart of the crisis.